Mid-engined layout, sleek elegance and performance to match sums up the Bora. 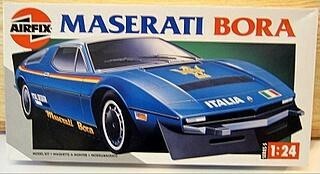 First produced in the early seventies, the Bora makes an ideal subject for an Airfix construction kit. When built the model has a length of 177mm.